After 35 years under the same ownership, the decision was made to move on from Yellowstone Aviation. Effective March 30, 2018, FBO services at the West Yellowstone Airport will be provided by Choice Aviation out of Cody, Wyoming. The name of the FBO at the West Yellowstone Airport will now be Choice Aviation. Please direct all inquiries for FBO services or airport operations to Choice Aviation at csr@choiceaviation.com. All inquiries sent to Yellowstone Aviation's email will be forwarded onto Choice Aviation. From all of us at Yellowstone Aviation, we would like to thank all of our customers for their support and friendship during the last 35 years. We truly appreciate your support. We have greatly enjoyed getting to know each and every one of you; we have so many great memories. Thank You!! We will miss you all as we move onto other adventures this summer. Yellowstone Aviation memorabilia is available on a limited basis. Please contact RJ or Sandy via our email wyi@filertel.com. May your flying days be filled with blue skies and fair winds. The Yellowstone Airport is located two miles north of the town of West Yellowstone on Hwy 191 and 45 miles south of the Big Sky Resort. The town of West Yellowstone is located at the west entrance to Yellowstone National Park. The Yellowstone Airport is also the closest, full-service airport to all the major attractions in Yellowstone National Park (Old Faithful – 30 miles, Canyon – 45 miles, Lake Hotel – 65 miles). The airport is at an elevation of 6644 feet and has an 8400 foot long runway. The instrument approaches include ILS, NDB and GPS. The airport has accommodated everything from Ultralights to C5A and C141 military cargo planes and Air Force One. There is a landing fee charged to all aircraft with a gross landing weight over 9,000 pounds and an overnight parking/tiedown fee starting at $5.00 for small general aviation aircraft with higher fees for larger aircraft. Due to the number of people in the area during the summer season, it is recommended that reservations be made as early as possible for hotel rooms and rental cars. Some of the hotels have airport shuttles. For those wishing to camp with their aircraft, there is a small campground located at the north end of the tiedown ramp for pilots and passengers. 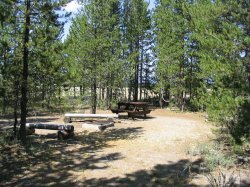 The campground is in the trees and has picnic tables, fire pits, a pit toilet and hot shower. The shower is generally available from mid June until September. Freezing temperatures before and after those dates limit the time of the showers operation. Tents can be pitched any where among the trees, and campers will generally share the tables and fire pits. The campground is provided and maintained by the Montana Aeronautics Division, and there is no charge for its use, however, the aircraft parking fee of $5.00 per night still applies. There is also a ramp service fee for aircraft over 9,000 pounds gross landing weight which is waived with fuel purchase. For user comments and fuel prices please go to AirNav.com. We try to keep all the information there up to date.